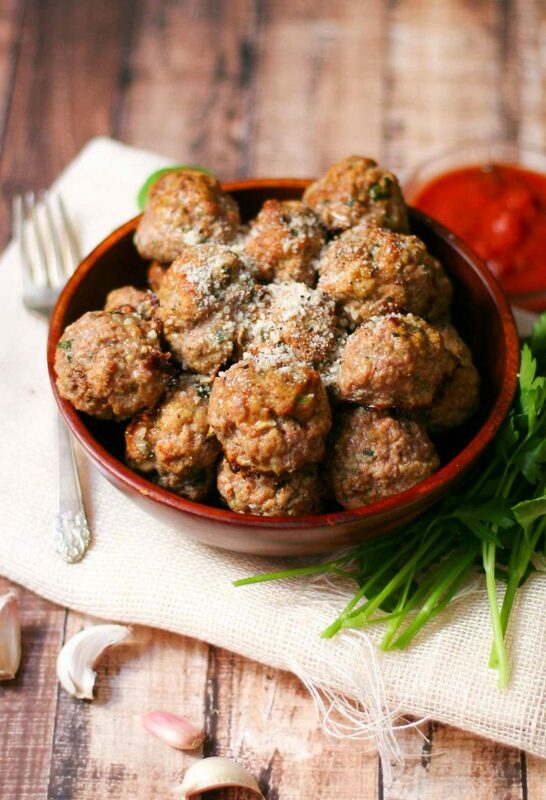 What’s your favorite way to cook meatballs? I was completely torn between baked & pan fried for awhile…. until I finally did a head to head test. I made one batch of meatballs, and pan fried one half, and baked the other. Much to my surprise, I actually preferred them baked! While the pan fried meatballs did get a nice crispy exterior, they totally lost their round shape. Plus, it was really annoying to try and rotate all the balls in the pan to try & get them crispy on all sides. WAY too much work for just a little payoff. 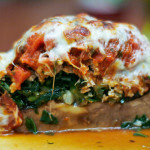 The baked meatballs, however, were SO easy (like just put them in the oven & wait 20 minutes). I brushed them with a little olive oil, so they were still nice & golden on the outside and retained their beautiful round shape. Recently, I’ve really been digging TURKEY meatballs (instead of beef or pork). 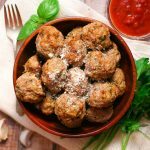 They have a lighter texture, and I love how the cleaner taste of the turkey meat allows the other flavors in the meatballs to shine through (which is key, since I add tons of herbs to my meatball mixture). 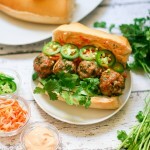 But anyways, these turkey meatballs are super easy to make. 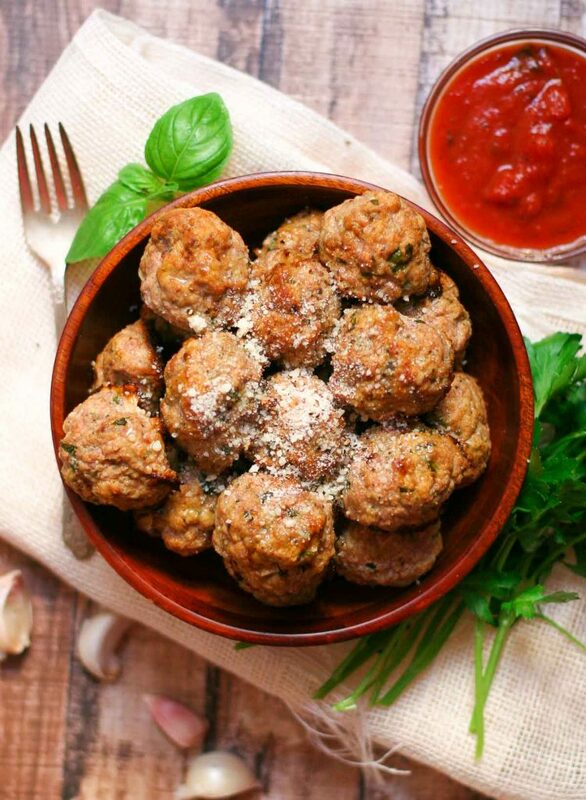 Just mix everything together with you hands in a large bowl, shape into meatballs, brush with olive oil, and bake for about 20 minutes. And while they bake, you can boil some pasta or set out some marinara for dipping. Love easy dinners like this. Meanwhile, add the ground turkey, breadcrumbs, Parmesan cheese, basil, parsley, milk, tomato paste, salt, pepper, egg, garlic, oregano, and red pepper flakes to a large mixing bowl. Mix together with your hands until well combined. Wash your hands very well with warm soapy water, then get out a rimmed baking sheet. Roll the meatballs into 1 1/2 inch balls (roughly 16 total), and place on the baking sheet. Brush with olive oil and bake in the oven for 20 minutes until lightly golden brown. 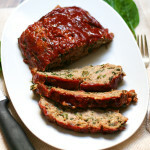 When done, remove from the oven and enjoy! The meatballs are great on their own, or over spaghetti, or dipped in marinara as an appetizer. They even make wonderful meatball subs for lunch the next day. 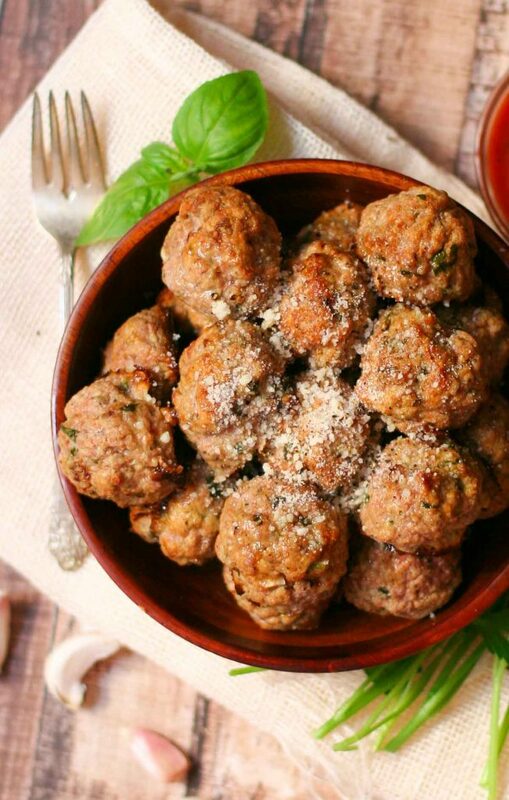 Turkey meatballs are one of my favorite go-to’s for weeknight dinners with my family. I will have to give these a try!